Simply the best on-line source for general information about the band. The site includes, lyrics, pics, discography, interviews, and audio samples. I can't say enough good things about this one. It's one of the main reasons I put the "Parting Glass" together. Great page with some good pics, video, and other info on the band. I'm not sure if this site is in the "Pogue Ring" or not, but it's another resource for the lyrics. An elegantly designed site that gives one man's interpretation of the guitar tabs for most of the Pogues and Shane MacGowan catalogue. The "official" Shane MacGowan web site. Lots of pics, interviews, articles, and news. A good fan site of all things Shane MacGowan. Boasts a complete discography of Shane's musical projects over the years. Based in Yugoslavia (! ), this site has some good links for Irish culture and music in addition to info on the band. Worth a looksie. The guys who run it are great. One of the early fan sites that disappeared for awhile, but is back. Some good info, articles, and interviews. This Pogue Ring site is owned by FranMoran. 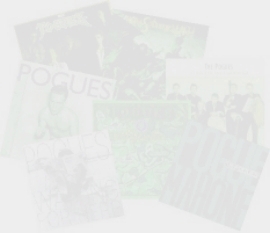 The list above is by no means exhaustive and some sites in the Pogues ring aren't listed here, so give that a go too.